For some unexplainable reason I've had the combo of fresh strawberries, balsamic vinegar, and goat cheese stuck in my head for the past few weeks. I see the bounty of (on sale!) strawberries at the grocery store and I just want to make a "Sarah salad": spinach leaves with goat cheese and a balsamic vinaigrette with fruit thrown in for good measure. And balsamic macerated strawberries over tangy goat cheese. I think it's just a beautiful combination that everyone needs to experiment with, including myself. And my latest experiment? 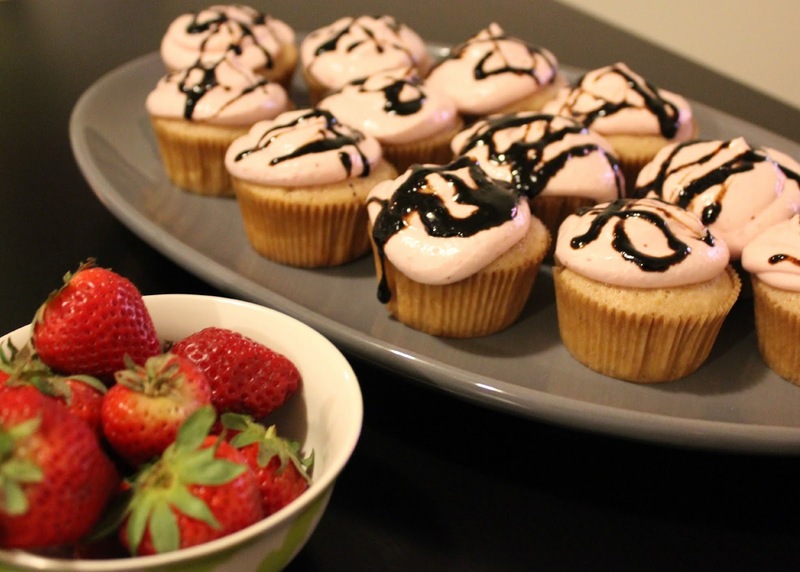 Strawberry cupcakes with goat cheese frosting and a balsamic syrup to drizzle over the top. Still here? Okay good, I thought I might scare some of you away. I am a big believer in mixing savory with sweet for desserts. It adds an unexpected twist and makes me feel like I'm on Chopped or Iron Chef. I'll admit, as a resident of a city who loves cupcakes I rarely make my own. I've got Georgetown Cupcake (original store patron, I used to get free cupcakes and champagne on Thursdays from the boutique next store! ), newly added Sprinkles, Hello Cupcake, a food truck devoted to cupcakes, my favorite Baked and Wired, and so many more! But I couldn't get this idea out of my head, cupcake shops be damned! I needed to make it! And you know what? Worth it. I should really listen to myself more often! In the spirit of DC cupcakes, I added lemon zest to a Sprinkles recipe. The egg white heavy batter ends up giving you an impossibly light yet moist cupcake that I don't think I've ever really noticed at the store (bad food kid!). I topped with my goat cheese frosting and a strawberry balsamic syrup. The syrup is much easier to manage if you let it simmer instead of bubbling at the beginning of cooking; boiling balsamic is like culinary napalm to the nostrils but a slow simmer controls the release of the smell and protects your stove from sticky splatter. The binding factor in all of the parts? Food processor buzzed up strawberry puree! Some in the cake, some in the frosting for color and flavor, and to temper the acidity in the balsamic syrup. The finished product is a gorgeous cupcake that would rival any of the cupcake bakeries, even in my town! First, preheat the oven to 350 and line a muffin tin with cupcake liners. Puree the strawberries in a food processor. No need to strain! Combine 1/3 cup of strawberry puree, 1/4 cup milk, 1 teaspoon vanilla, and lemon zest. Set aside. Whisk together the dry ingredients: flour, baking soda, and salt. Set aside. Cream the ROOM TEMPERATURE butter with an electric mixer and then slowly add the cup of sugar, until the mixture is lighter and fluffier. Add the egg and white, one at a time with the mixer. At this point, put the mixer away! Fold in half of the flour mixture then add the wet mixture. Finally, add the rest of the flour mixture and fold gently. Scoop into the cupcake liners, about 3/4 of the way full. Bake for 22-25 minutes, until the top of the cupcakes are dry to the touch. Pull from the oven and let cool in the tin. While cooling, prepare the frosting . . .
First, mix together the room temperature cream cheese and goat cheese. Add the sugar, salt, lemon juice, and strawberry puree. To frost, use a knife or a zip top bag repurposed into a pastry bag. A large cut in the corner is my style for icing cupcakes! Now for the final step . . .
Over medium low heat in a small sauce pan, reduce the balsamic vinegar by half. This should take about 30-45 minutes. Add in 2 tablespoons of strawberry puree and the brown sugar. Let cook until syrupy. Add the final 2 tablespoons of strawberry puree at the end, to keep a bright strawberry flavor in the syrup. Drizzle over the iced cupcakes when cooled. Wow! I've never heard of goat cheese frosting before and that too with a balsamic reduction on it. But, I'm glad it worked because the recipes sounds awesome! I've had many Chopped/Iron Chef like experiments in the kitchen too LOL But, not all of them are a success Hehehe Props to you for getting adventurous and succeeding at it! Did i read goat cheese frosting???? wow sounds so interesting....great idea.